This symbol indicates that this lawyer is certified by the Supreme Court of New Jersey as a Civil Trial Attorney. The Supreme Court designates lawyers as “Certified” only when they’ve met those standards and criteria mandated by the Court. Super Lawyers is a listing of outstanding lawyers from more than 70 practice areas who have attained a high degree of peer recognition and professional achievement. 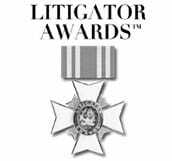 Bar associations and courts across the country have recognized the legitimacy of the Super Lawyers selection process. Inclusion in Super Lawyers is based entirely on peer review. © 2017 Super Lawyers®, Super Lawyers is a registered trademark of Thomson Reuters. Inclusion in Best Lawyers is based entirely on peer review. 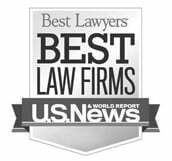 For decades, the top lawyers in the U.S. have helped make The Best Lawyers In America the leading legal referral guide by candidly evaluating the work of other top lawyers in the same practice areas and geographic areas. Avvo rates and profiles every attorney so that people can choose the right attorney. Lawyer profiles contain helpful information, including a lawyer’s experience, areas of practice, disciplinary history, and ratings from clients. Best Law Firms 2010, 2014, 2015, 2016 & 2017: The firm received New Jersey State Tier 1 ranking in the fields of Plaintiffs’ Product Liability, Medical Malpractice & Personal Injury Litigation. For information regarding selection methodology, please go to: http://bestlawfirms.usnews.com/methodology.aspx. To view a .pdf of the 2017 Best Law Firms press release, click here. The Martindale-Hubbell® Peer Review Ratings™ are an objective indicator of a lawyer’s high ethical standards and professional ability, generated from evaluations of lawyers by other members of the Bar and the Judiciary in the United States.